The Natural Disaster Youth Summit (NDYS) is a year round project in which children will learn the importance of human lives and how to cope with natural disasters such as earthquakes, volcanic eruptions, wildfires, floods, hurricanes, landslides, tsunamis, droughts and so on through the communication and collaboration with global friends. Students will acquire the knowledge of systems of disasters and skills to reduce the future disasters. Children can make a difference in the world. Our goal : is to build the safer place to live in for everyone in this planet. 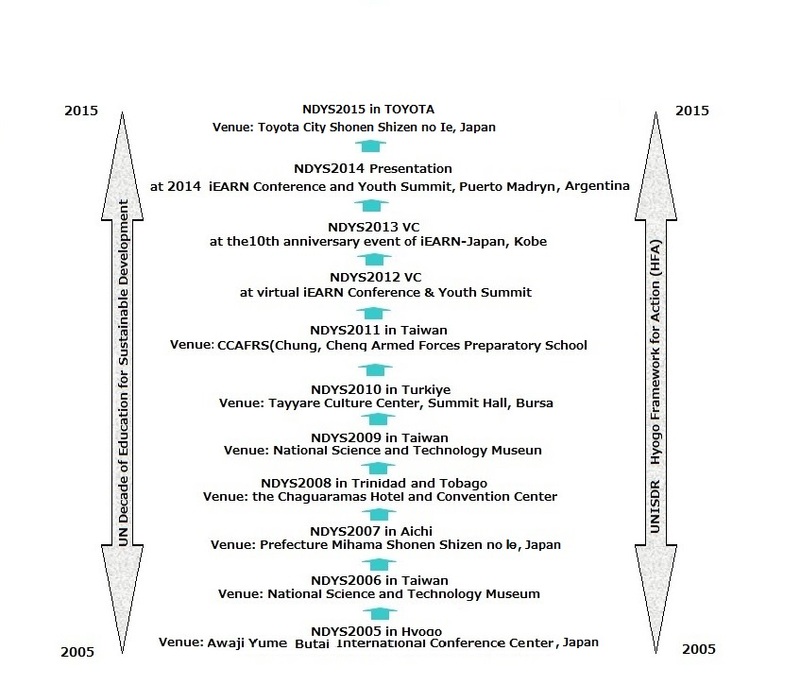 The annual face-to-face Natural Disaster Youth Summit was first organized in Hyogo in May 2004 and started from September 2004, commemorating 10th anniversary of great Hanshin Awaji Earthquake, Japan. This year's project will lead up to a face-to-face Natural Disaster Youth Summit in conjunction with the annual 2011 iEARN Conference and Youth Summit, to be held in Kaohsiung, Taiwan from July 17-23, 2011. We will host NDYS2011 in Taiwan on 20th July, 2011. The place is at 中正預校CCAFPS (CHUNG.CHENG ARMED FORCES PREPARATORY SCHOOL in Kaohsiung). With the help of the school and NDYS members in Taiwan. All contents copyright © NDYS office all rights reserved.